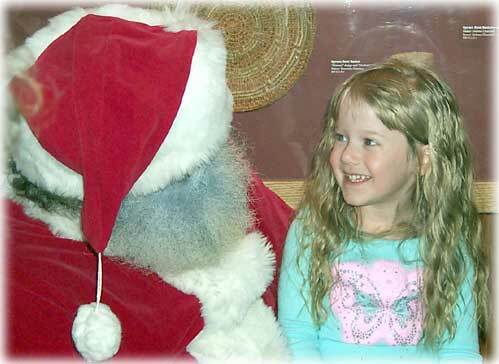 It's all smiles for Audrey Kistler, who is very happy to be sitting with Santa. Ketchikan: Listen to this story... Representatives from non-profit organizations packed the Ketchikan City Council meeting Tuesday night as the Council debated funding for fourteen non-profit organizations. Deanna Garrison reports. Ketchikan: Listen to this story... A pair of Ketchikan musicians released an album of original songs recently. Maria Dudzak has more. 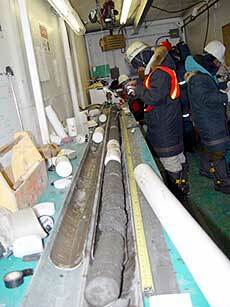 Science News: Gas Hydrates - Will They be Considered in the Future Global Energy Mix? - For the first time, an international research program involving the Department of the Interior's U.S. Geological Survey has proven that it is technically feasible to produce gas from gas hydrates. Gas hydrates are a naturally occurring "ice-like" combination of natural gas and water that have the potential to be a significant new source of energy from the world's oceans and polar regions. Festive holiday lights are appearing daily throughout the Ketchikan community. 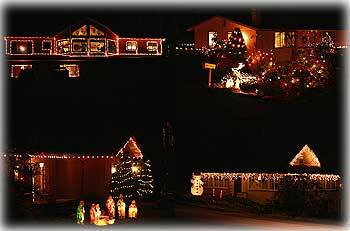 These colorful gifts of lights are provided by families for the enjoyment of all. Carl Thompson is traveling the community to capture these colorful light displays to share with the Sitnews readers. What Republicans Want in 2004 - The GOP's main goal in 2004 is to win big in the presidential and senate races. That's obvious. What's less obvious is how they hope to get there. Basically, what they want is Dean to be the Democrat presidential nominee in 2004 because they see him as the 2004 version of Walter Mondale, who also said he wanted to raise taxes when he ran in 1980 against my father. He promptly went down in a humiliating defeat.